স্বীকৃত আঞ্চলিক ভাষাসমূহ Nepal Bhasa, Maithili, Bhojpuri, Tharu, Gurung, Tamang, Magar, Awadhi, Sherpa, Kiranti, Limbu and altogether 103 different spoken languages out of which many languages are spoken in very less numbers. ↑ Department of Economic and Social Affairs Population Division (2009) (PDF). World Population Prospects, Table A.1. 2008 revision. United Nations. http://www.un.org/esa/population/publications/wpp2008/wpp2008_text_tables.pdf। আহৰণ কৰা হৈছে: 12 March 2009. 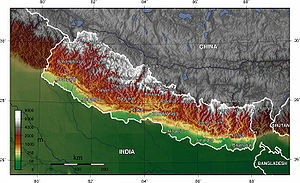 ↑ "Nepal Census 2011". Central Bureau of Statistics (Nepal). http://sites.google.com/site/nepalcensus/home/preliminary-result-2011। আহৰণ কৰা হৈছে: 6 March 2012. ↑ 4.0 4.1 4.2 4.3 "Nepal". International Monetary Fund. http://www.imf.org/external/pubs/ft/weo/2012/01/weodata/weorept.aspx?pr.x=46&pr.y=13&sy=2009&ey=2012&scsm=1&ssd=1&sort=country&ds=.&br=1&c=558&s=NGDPD%2CNGDPDPC%2CPPPGDP%2CPPPPC%2CLP&grp=0&a=। আহৰণ কৰা হৈছে: 20 April 2012. ↑ "Human Development Report 2011. Human development index trends: Table G". The United Nations. http://hdr.undp.org/en/media/HDR_2011_EN_Tables.pdf। আহৰণ কৰা হৈছে: 5 November 2011. ↑ "The World Factbook : Rank order population". CIA. https://www.cia.gov/library/publications/the-world-factbook/rankorder/2147rank.html. ↑ "CIA Factbook, Nepal, "People" section". Cia.gov. https://www.cia.gov/library/publications/the-world-factbook/geos/np.html#People। আহৰণ কৰা হৈছে: 29 July 2009. ↑ "Human Development Report 2010 – Nepal". Hdrstats.undp.org. http://hdrstats.undp.org/en/countries/profiles/NPL.html। আহৰণ কৰা হৈছে: 25 Jan 2011.